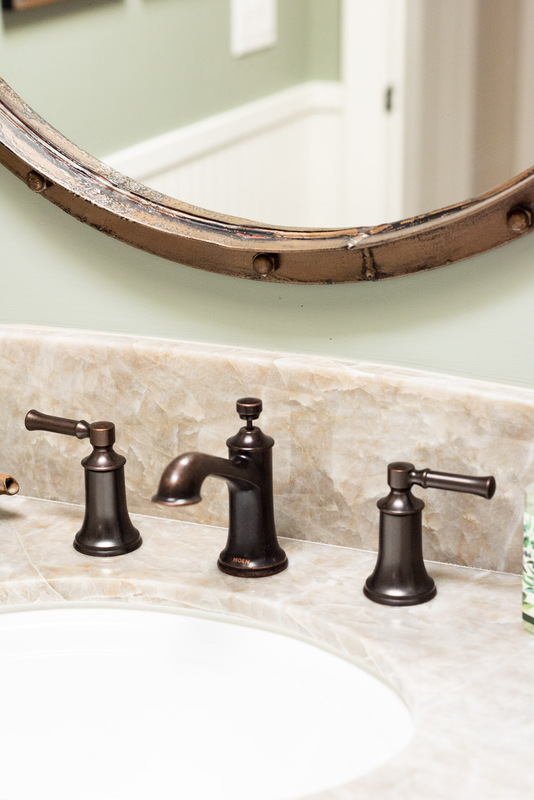 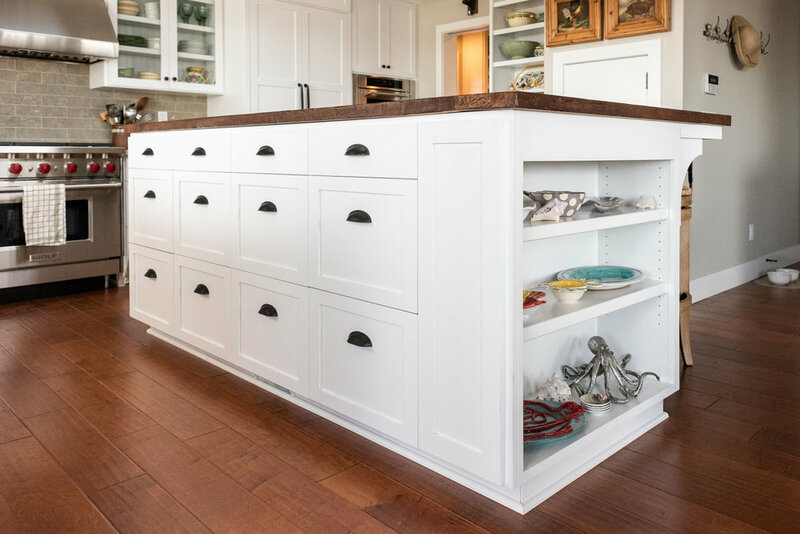 Custom Cabinets Design & Inspiration Blog — Sligh Cabinets, Inc. 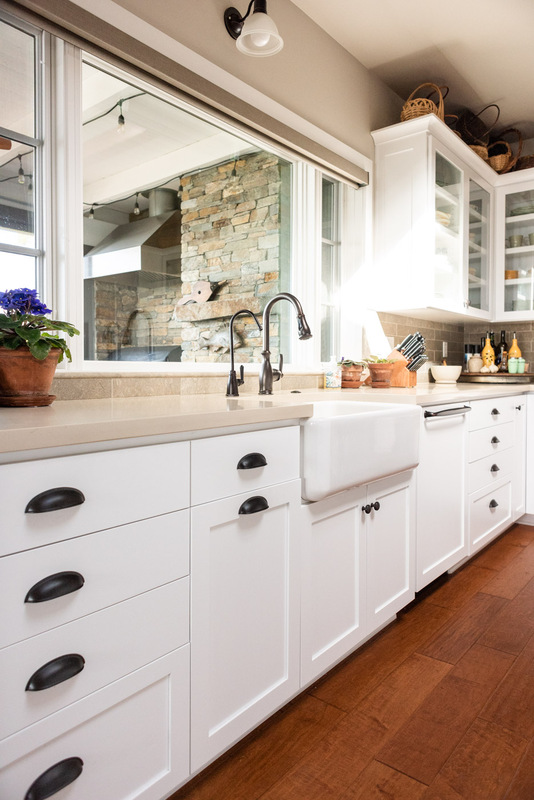 Designing a kitchen may seem daunting, with so many details to consider. 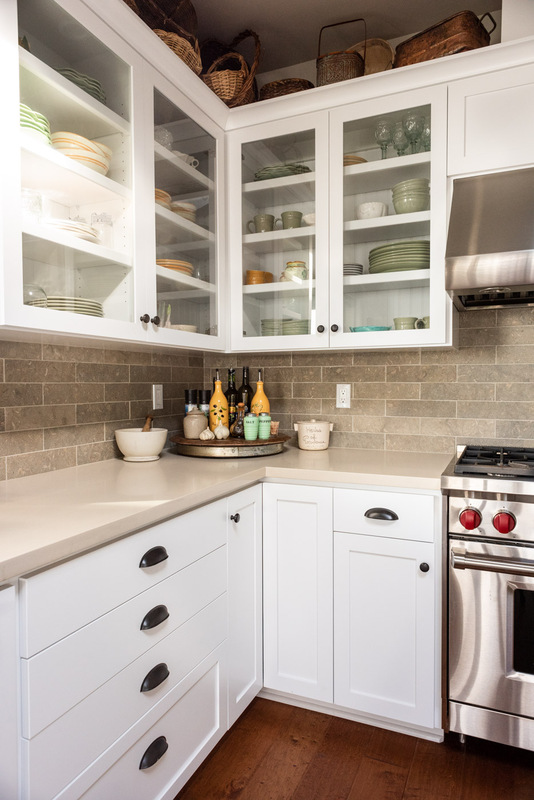 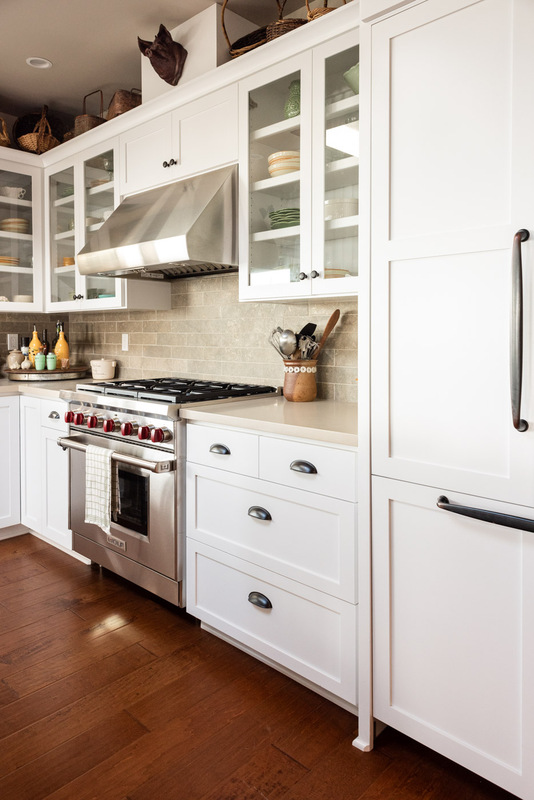 While kitchen cabinet hardware appears to be a small element, it often makes as much of a statement as light fixtures and cabinet doors. 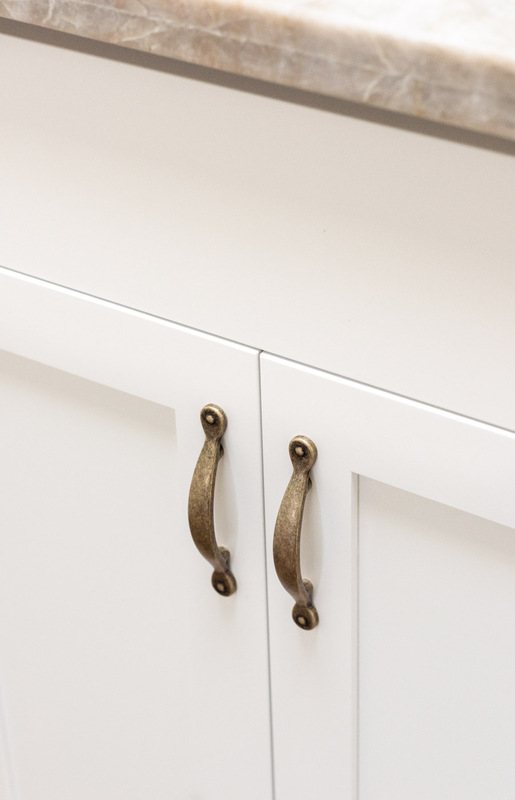 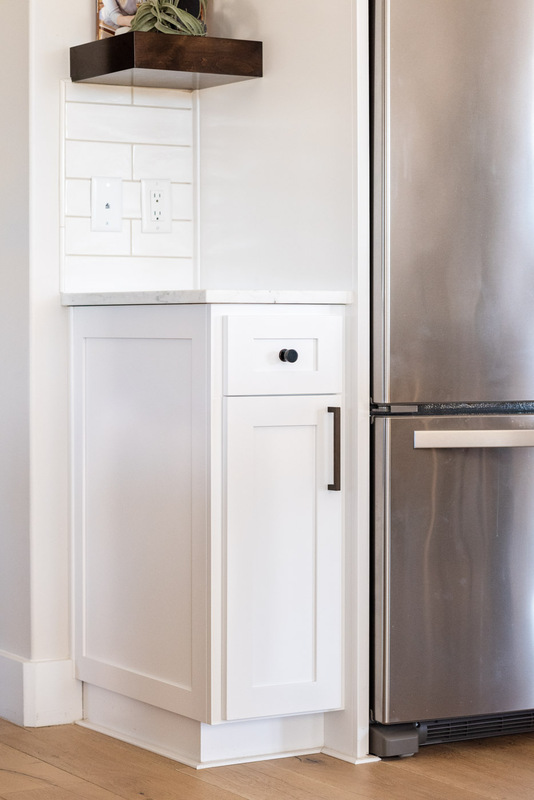 Use these tips to help you choose the perfect hardware for your kitchen cabinets. 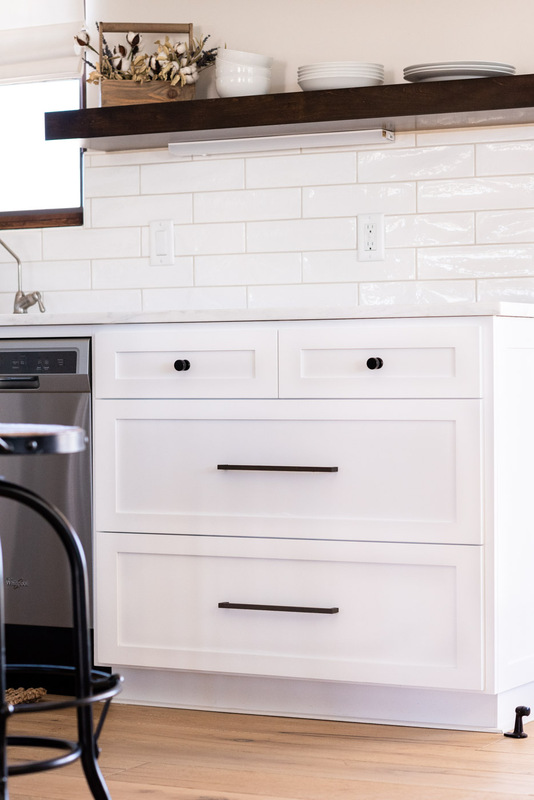 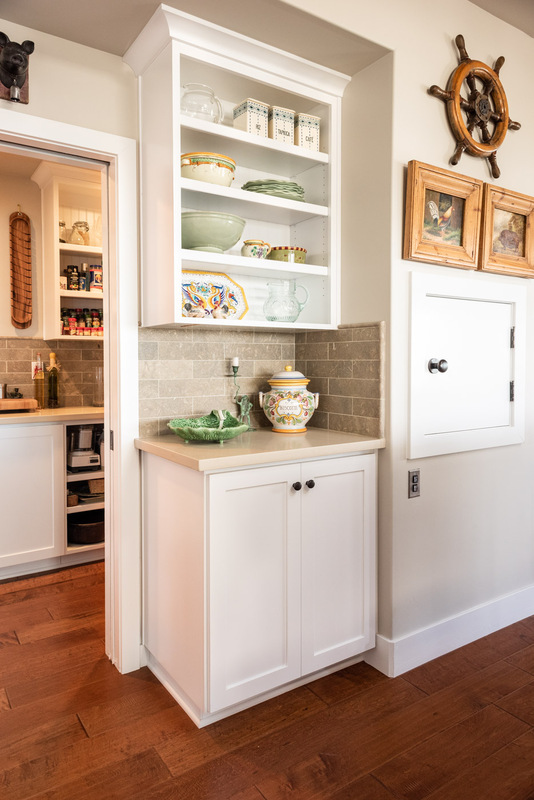 Understanding cabinet door styles can help you make an informed decision for your kitchen, bath, or other cabinetry design. 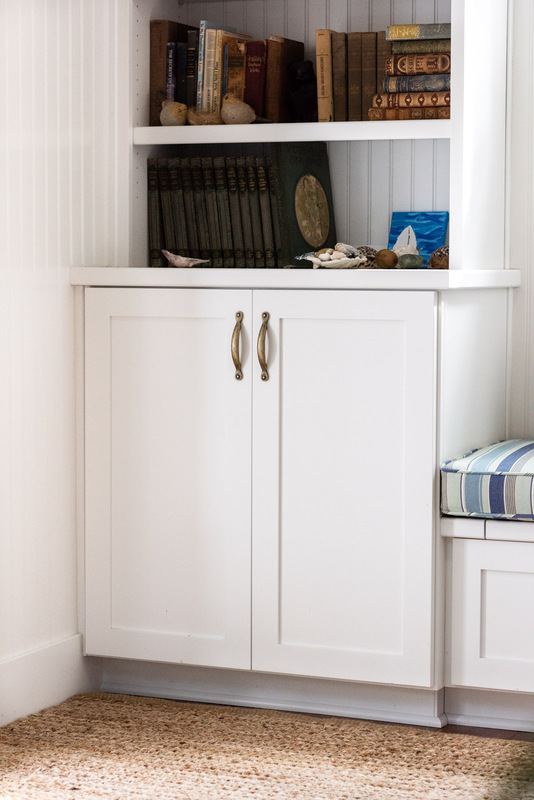 We’ve broken down the most common terms to know when describing cabinet doors so that you feel confident deciding which door fits your particular interior design style. 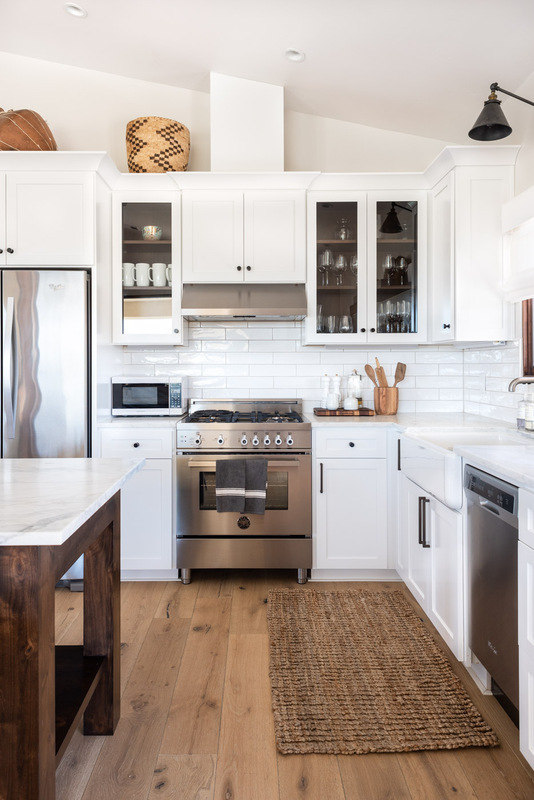 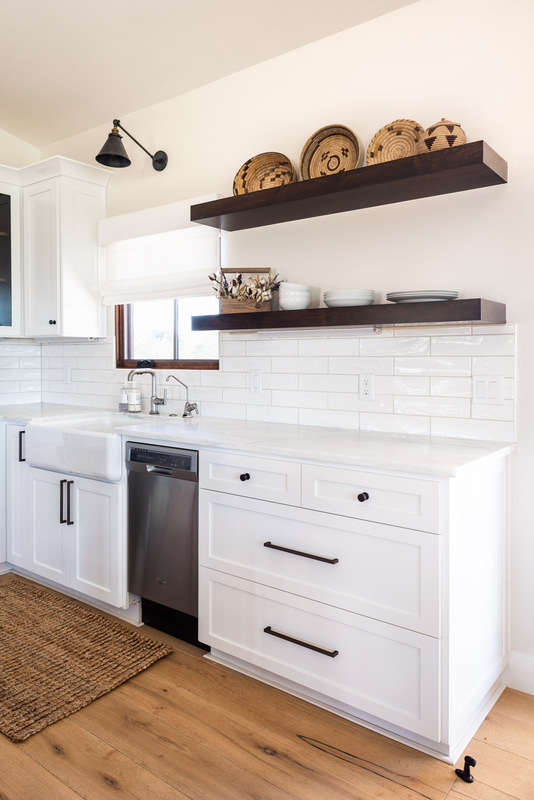 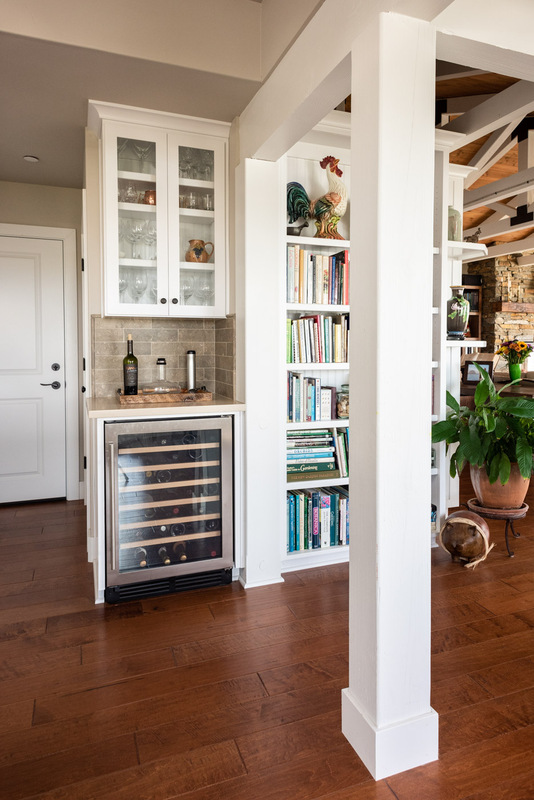 Before diving into the design of a new kitchen layout, it’s helpful to understand and define how you typically use your space. 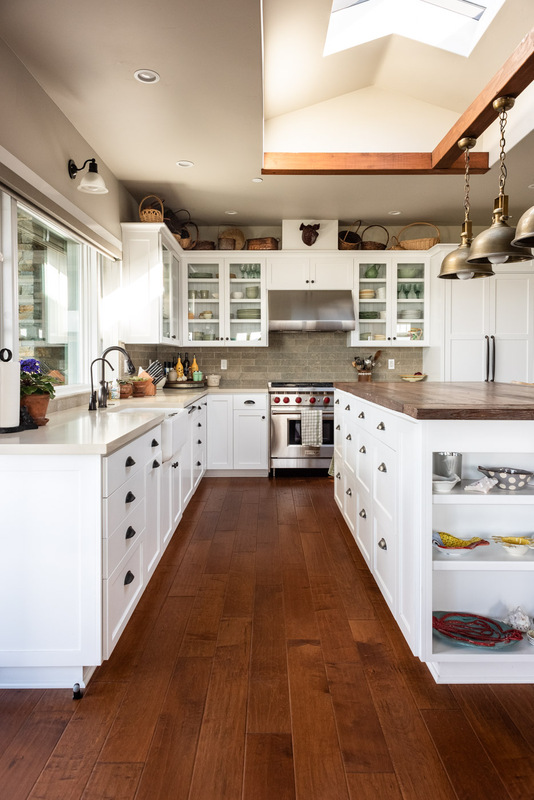 This will help you make decisions such as where to place large appliances or whether to have a large island versus a smaller peninsula. 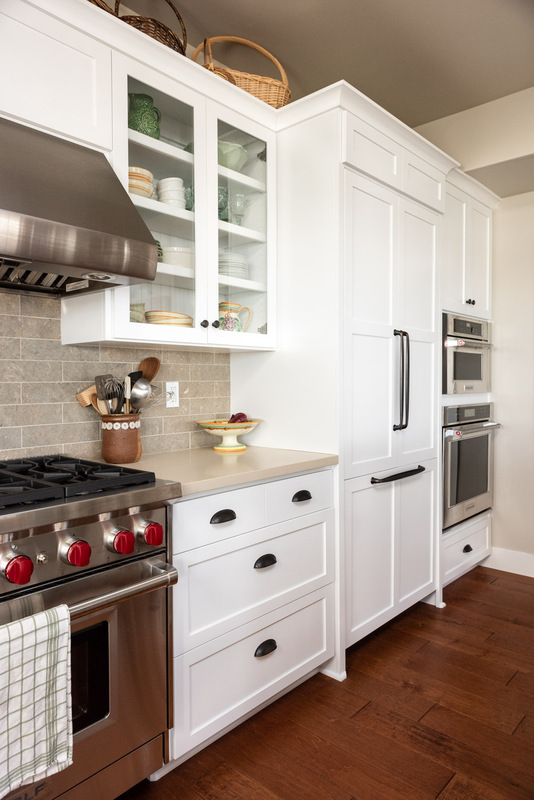 Here at Sligh Cabinets, we treat every project like it’s our own. 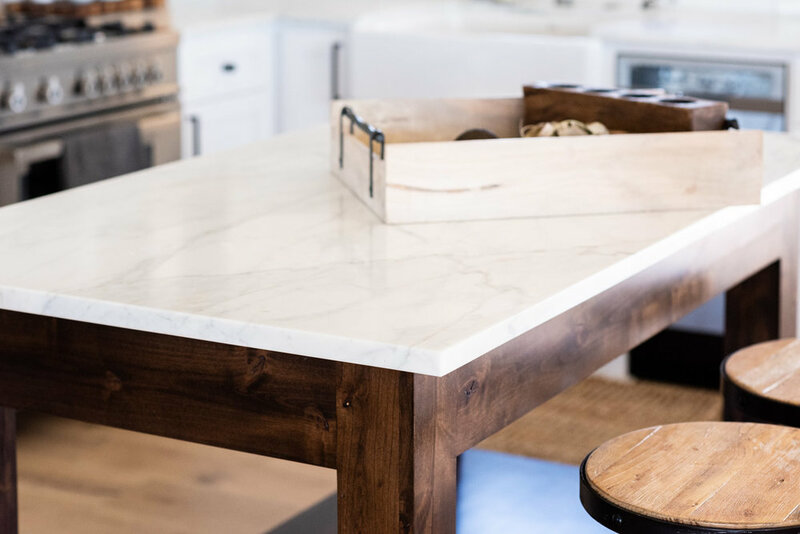 We take our time with the design process to ensure every detail has been discussed and approved before we start production. 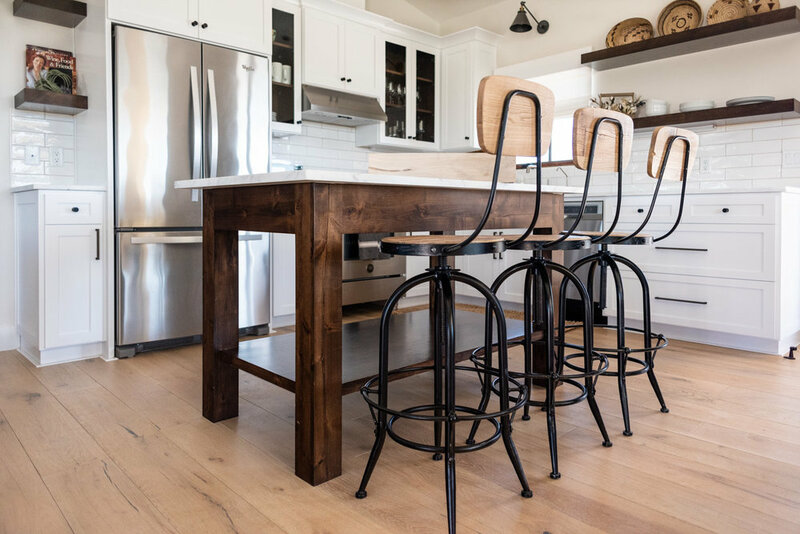 Our team is involved and available to answer questions and it is our goal to see your project through to completion. 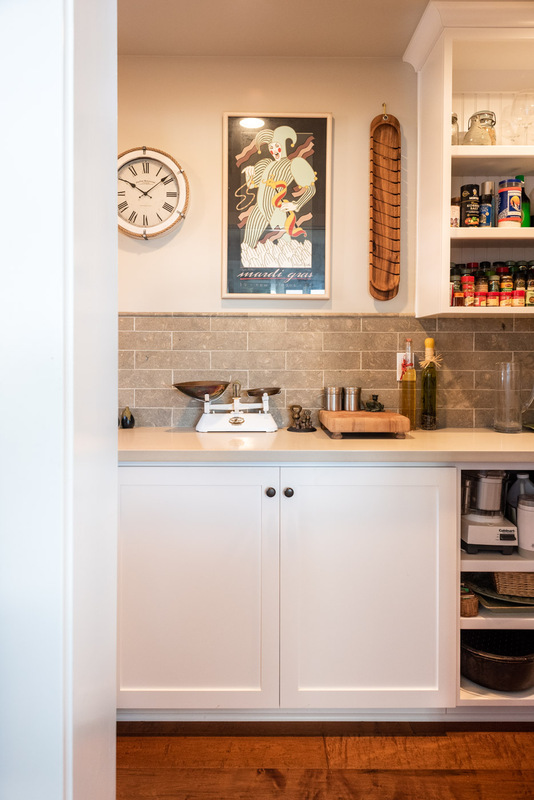 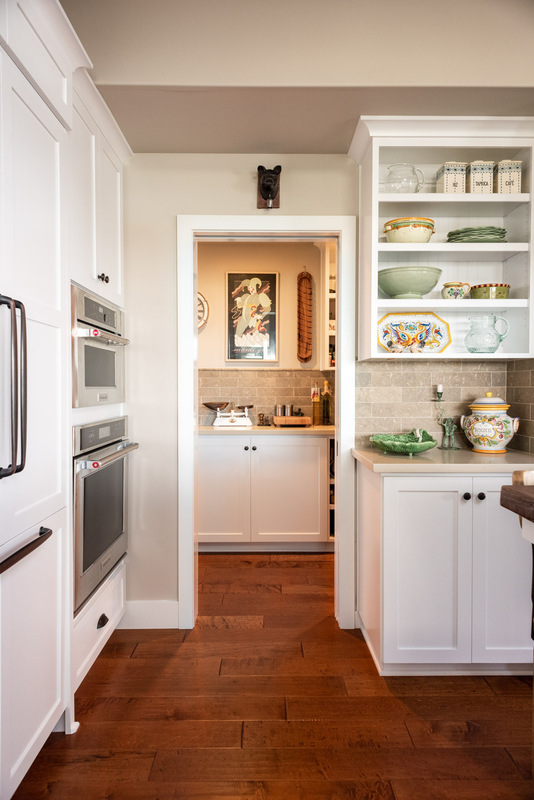 A nod to the modern farmhouse trend, this vacation rental kitchen provides a cozy and magazine-worthy cooking and entertaining space. 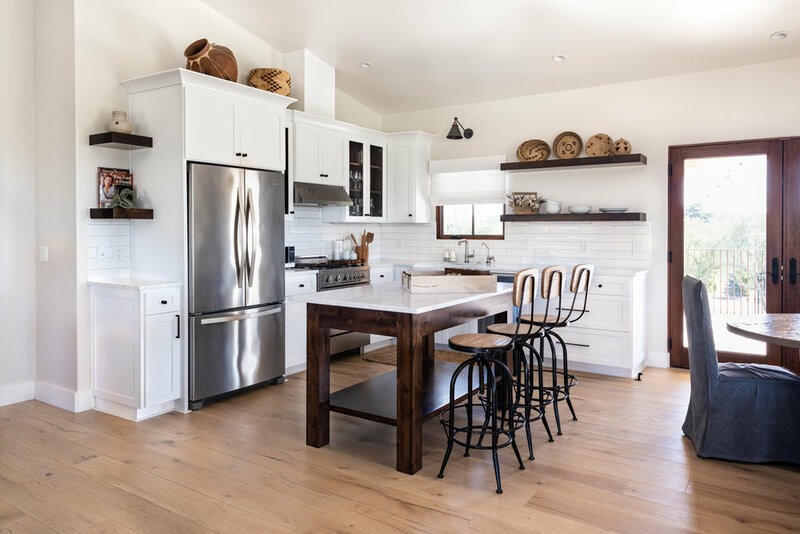 Open wood shelves, a free-standing custom wood kitchen island and white shaker cabinets create a perfect blend of modern and rustic styles. 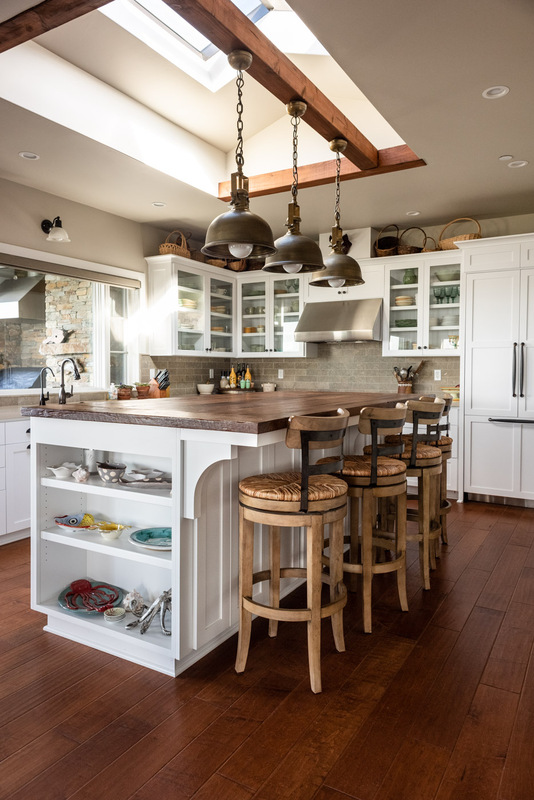 The L-shape layout allows the kitchen to open up to the dining and living areas while maintaining plenty of food prep space. 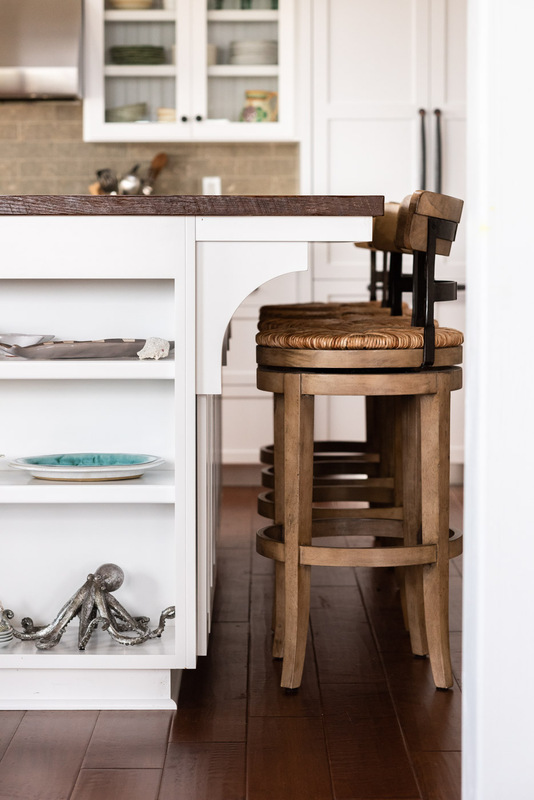 The free-standing wood island adds to the space without obstructing light or the view from the kitchen window. 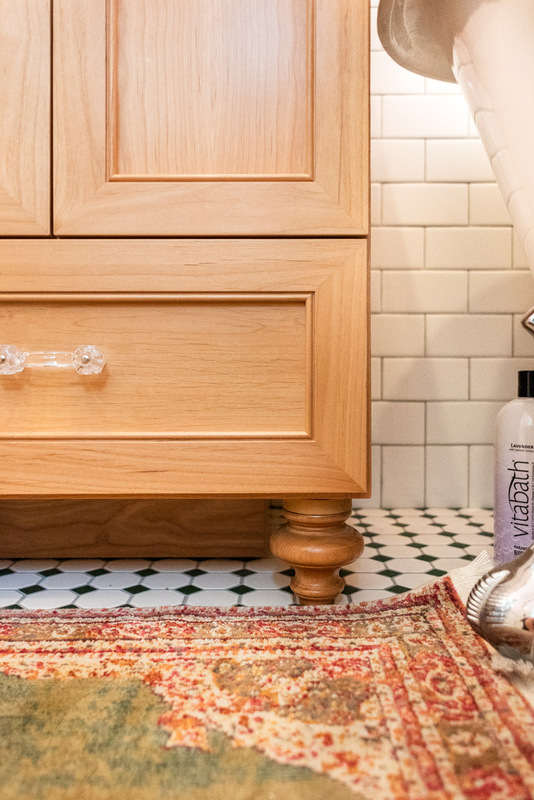 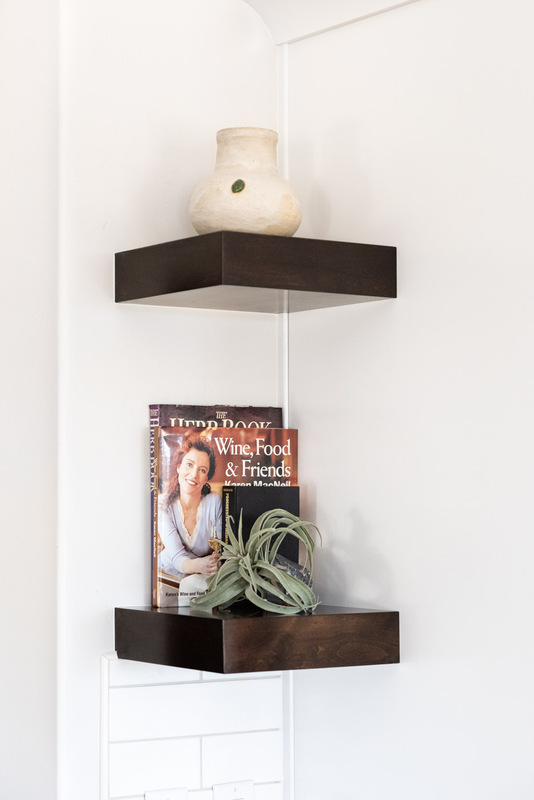 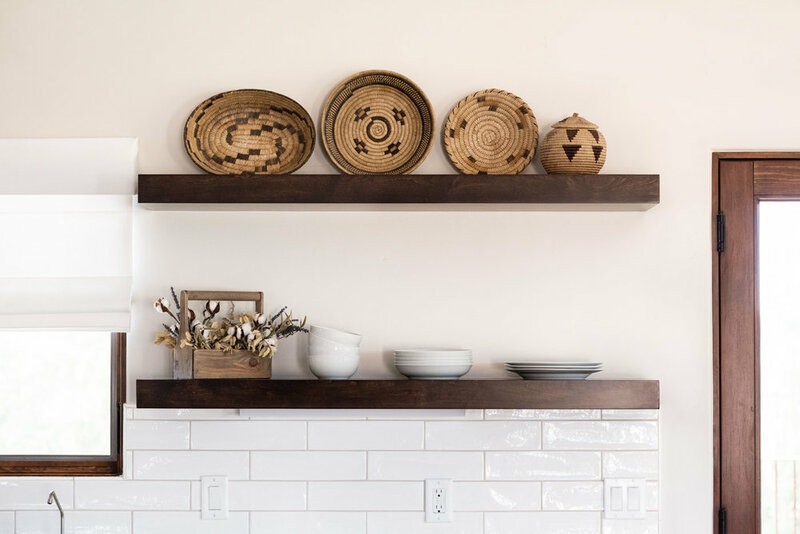 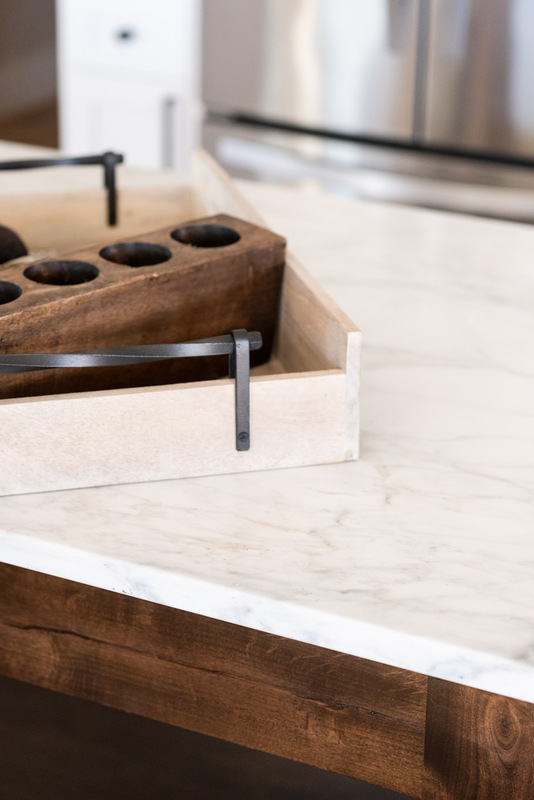 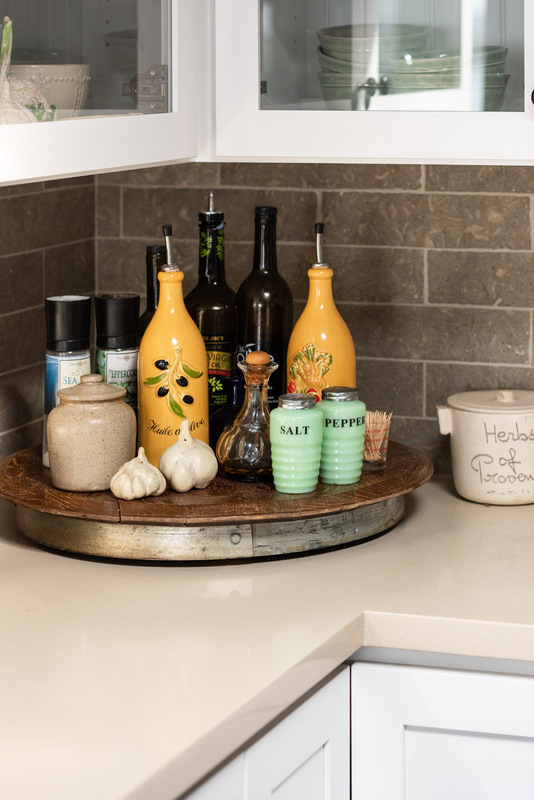 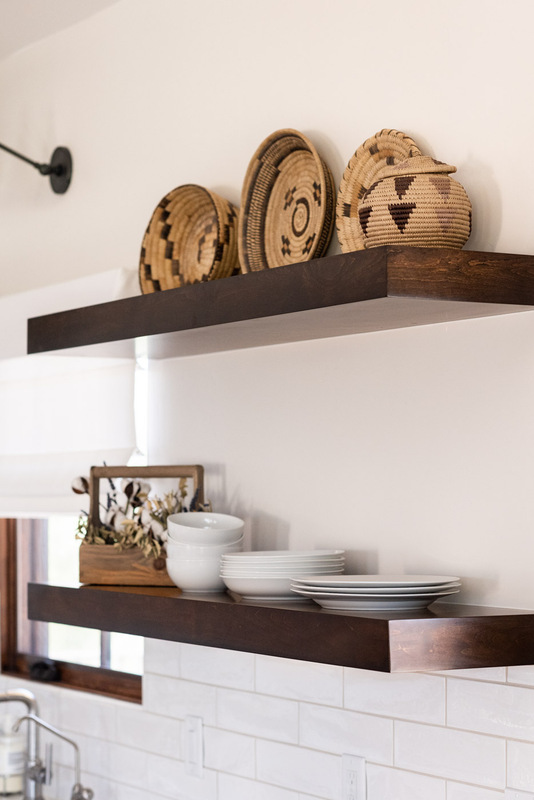 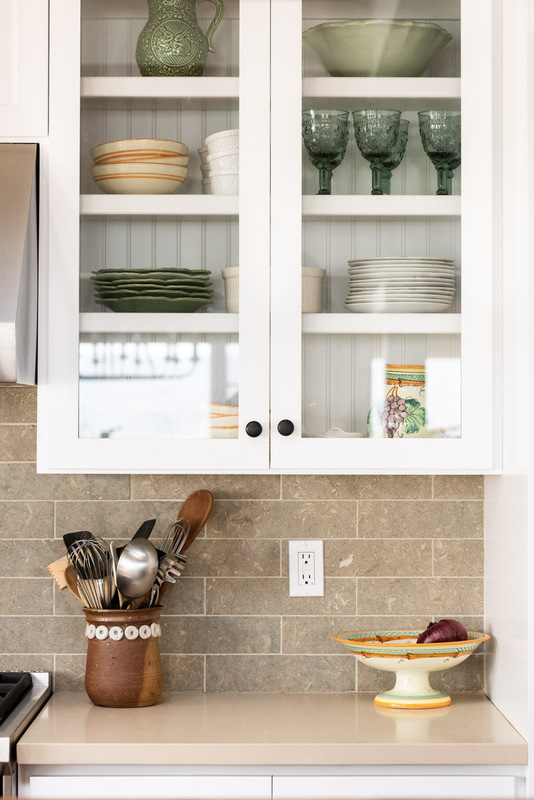 Cabinet storage is strategically placed to showcase dinnerware while hiding the less-attractive items, such as appliances and cleaning supplies. 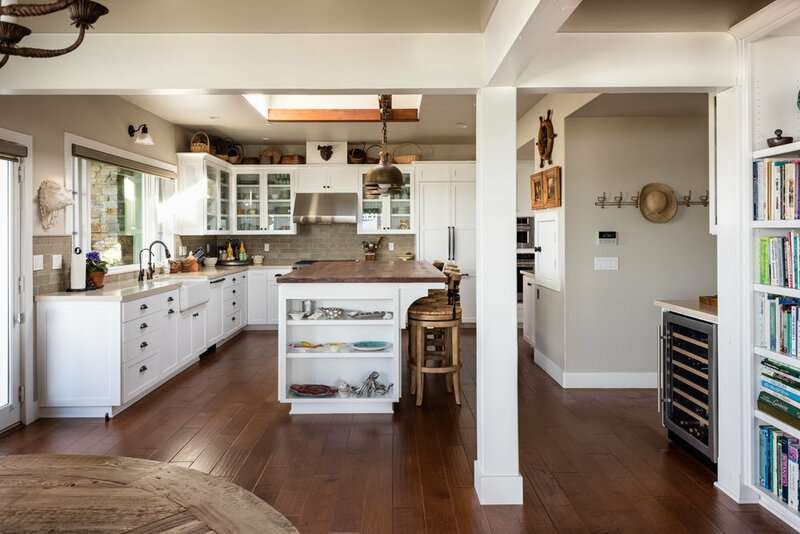 This fully-custom San Luis Obispo home highlights the personality and creativity of its’ homeowners. 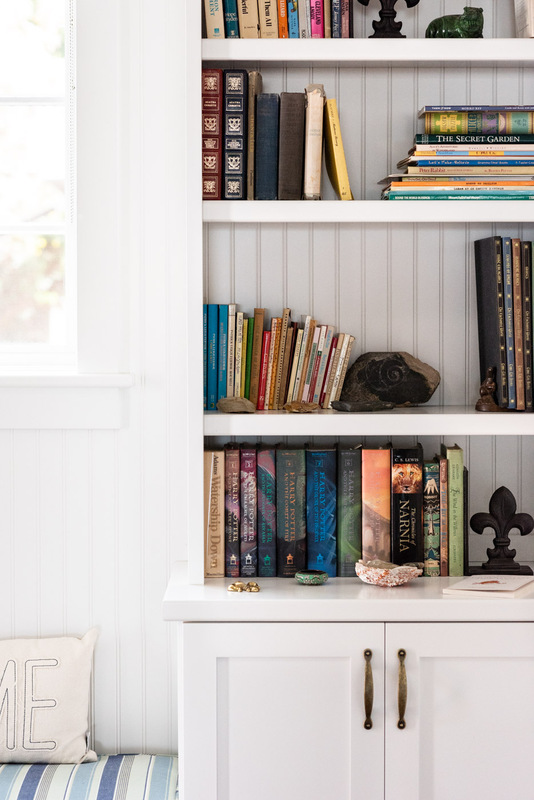 A blend of vintage, cottage and craftsman elements create a friendly and cozy aesthetic that is just what this family needs to feel right at home. 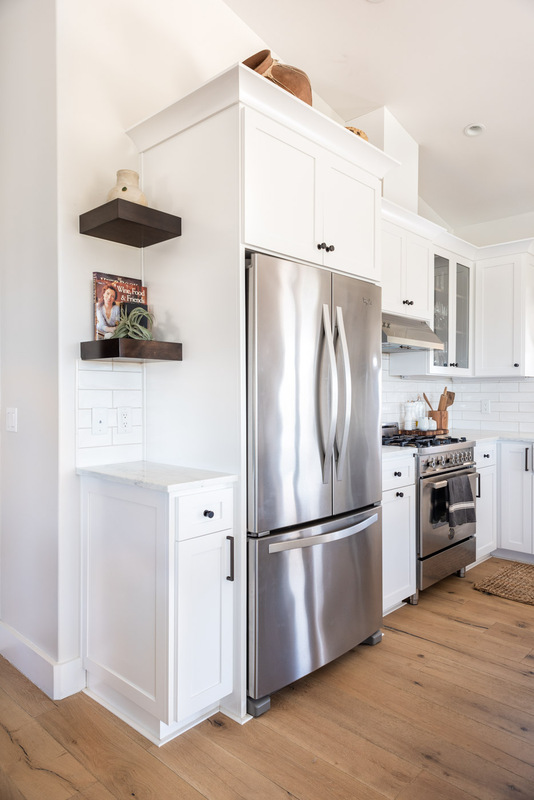 The most obvious feature of this kitchen is it’s mixture of blue and white painted cabinets as well as stained wood refrigerator panels and wine shelving. 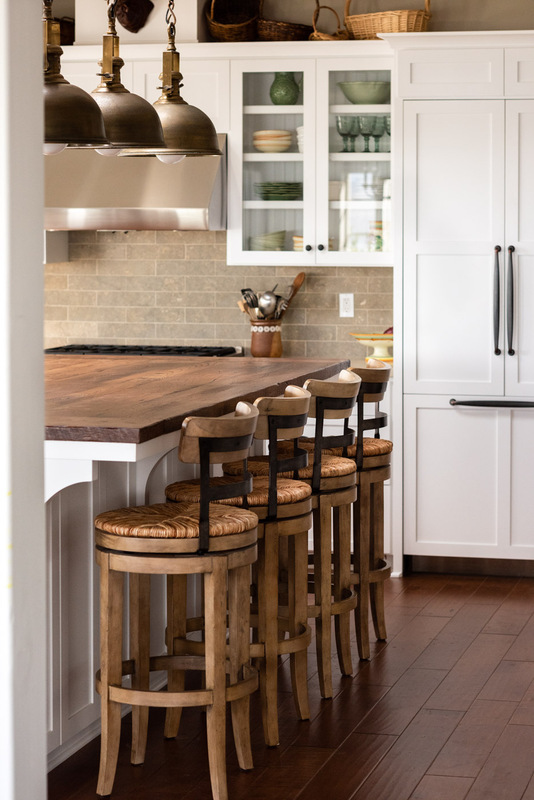 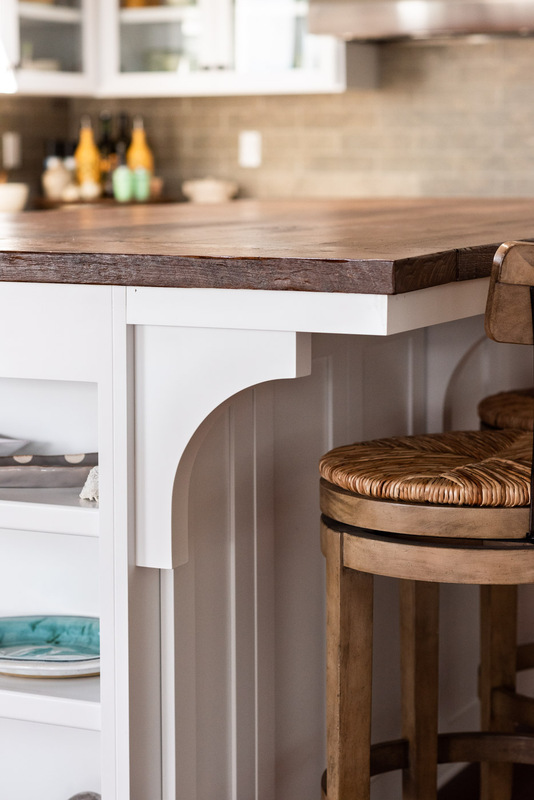 Two large free-standing islands make a bold statement to draw your eye into the space toward the vintage oven and range, while a custom built-in bench creates a cozy breakfast and dining area on the perimeter. 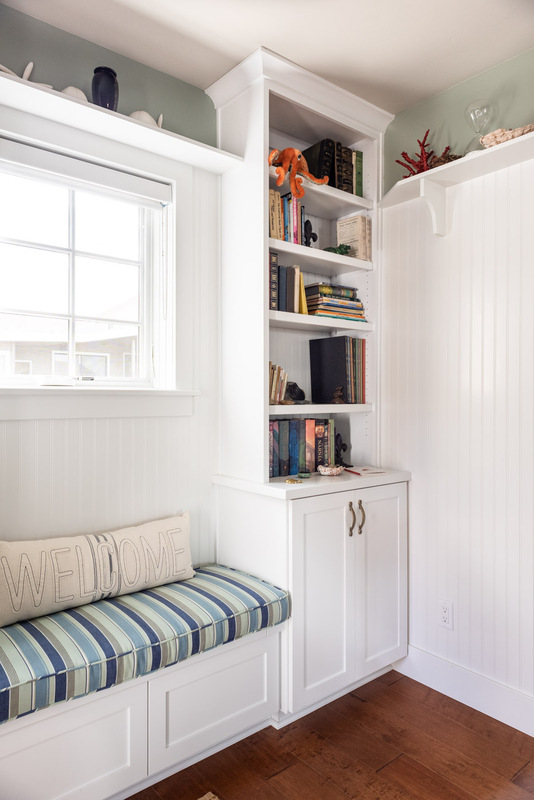 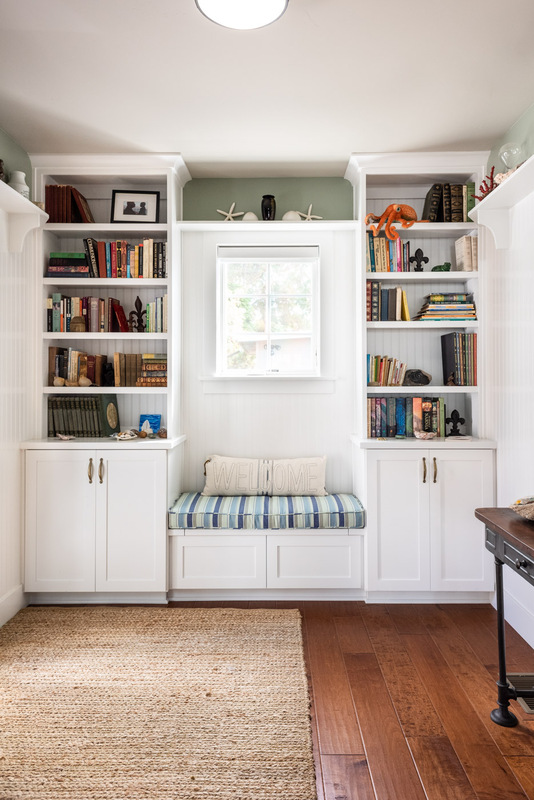 Complete with a custom furniture hutch, computer desk, bookcases and multi-purpose storage, this living room built-in cabinet provides almost every possible storage and display solution. 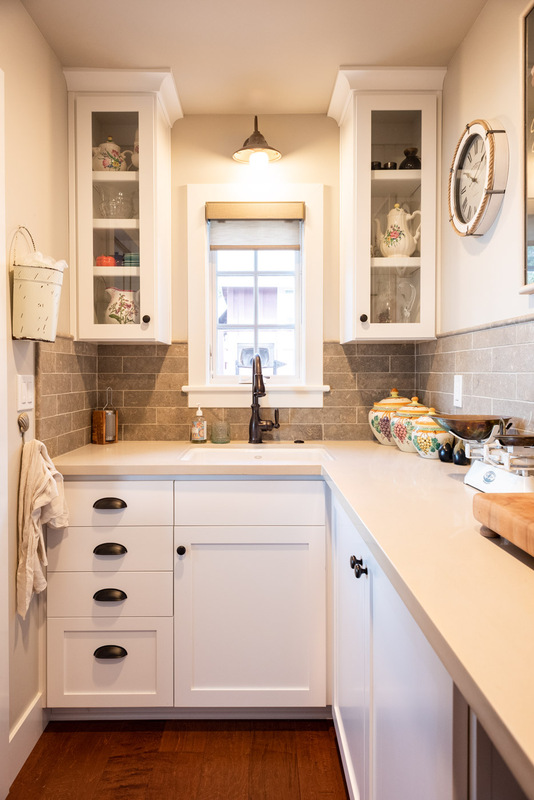 A small dedicated laundry room features extra tall countertops, cabinet openings to house side-by-side appliances, and a farmhouse sink, perfect for cleaning tricky stains or items that are intended to be washed outside of the kitchen. 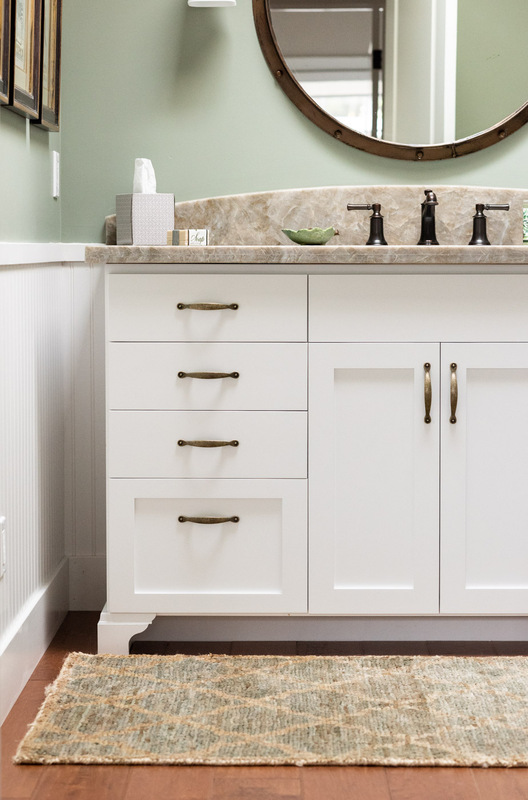 The master bathroom vanity has a unique layout, with double sinks separated my a makeup station and vintage ottoman. 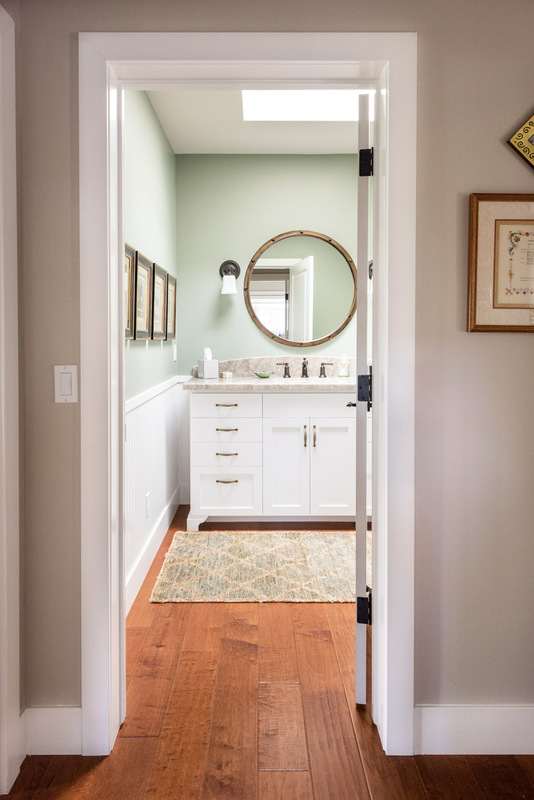 Curvy furniture base feet give the cabinets a vintage feel while custom wood mirror frames create consistency with the natural wood cabinet finish.